1. The aim of Anatolian Journal of Psychiatry is to present on a scientific level and share the theoretical information and clinical experience in the field of behavioral sciences, primarily psychiatry, and create a forum. 2. Anatolian Journal of Psychiatry publishes research, review, case report, original articles/essays which will expand horizons in education/practice and psychiatry, translated articles, letter/discussion, book and thesis overviews in the field of psychiatry and related fields. To cover publication costs, Anatolian Journal of Psychiatry /Anadolu Psikiyatri Dergisi levies an article-processing charge of $400 for each article accepted for publication. This charge would be received only after acceptance of the article. 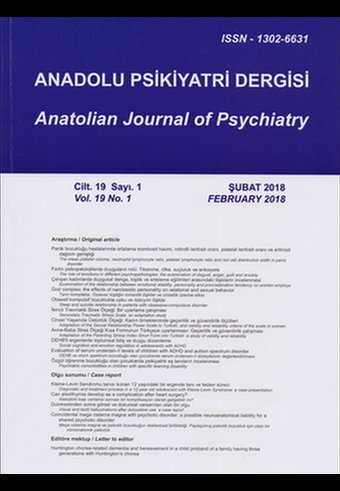 The publication of an article in the peer-reviewed journal “Anadolu Psikiyatri Dergisi /Anatolian Journal of Psychiatry is an essential building block in the development of a coherent and respected network of knowledge. It is a direct reflection of the quality of the work of the authors and the institutions that support them. Peer-reviewed articles support and embody the scientific method. It is therefore important to agree upon standards of expected ethical behaviour for all parties involved in the act of publishing: the author, the journal editor, the peer reviewer, the publisher and the society of society-owned or sponsored journals. Anadolu Psikiyatri Dergisi, Turkey, as publisher of the journal, takes its duties of guardianship over all stages of publishing extremely seriously and we recognise our ethical and other responsibilities. Peer review assists the editor in making editorial decisions and through the editorial communications with the author may also assist the author in improving the paper. Peer review is an essential component of formal scholarly communication, and lies at the heart of the scientific method. Cukurova Medical Journal shares the view of many that all scholars who wish to contribute to publications have an obligation to do a fair share of reviewing.